Discover the Power of Palms! 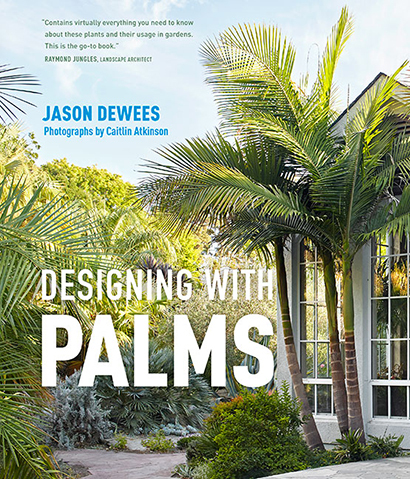 Learn how to make a statement with beautiful, useful palms with Jason Dewees, Sat., September 1 at 11 am! Join us for a fascinating and fun exploration of all things palm and how to use them in Bay Area gardens with Jason Dewees, horticulturist and palm expert at SF’s Flora Grubb Gardens on Saturday, September 1 at 11 am! We can grow some of the coolest palms in the world right here in the Bay Area, and many are easy from seed! Jason’s enthusiasm and knowledge of palms will open your eyes to their beauty, diversity and versatility in different garden styles. Bonus! He’ll be signing his beautiful new book from Timber Press, “Designing with Palms” and we'll have a FREE raffle to follow. Just show up by 11 am to snag a free raffle ticket! Great Companion Plants for Palms! Lush, evergreen foliage loaded with chubby 6" clusters of rosy-apricot blooms Summer thru Winter make this EASY shrub/vine a winner in any (tropical or not) garden. Tolerates blistering heat, drought and it’s deer resistant. Not fussy about soil, hardy USDA zone 8. 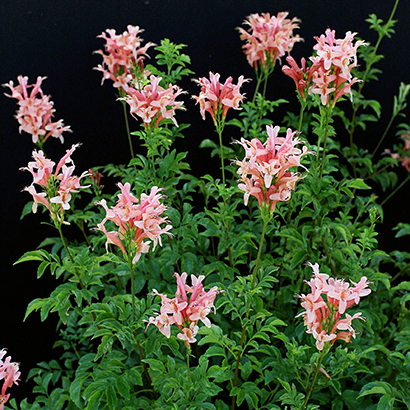 Crazy cool upright bloom spikes, lush tropical foliage and a surprising buttery scent are propelling this African perennial into new-found popularity! Fast-growing rich soil, breathtaking combined with large-leaved bananas and cannas. To 4' x 5'. Disease and pest-free! 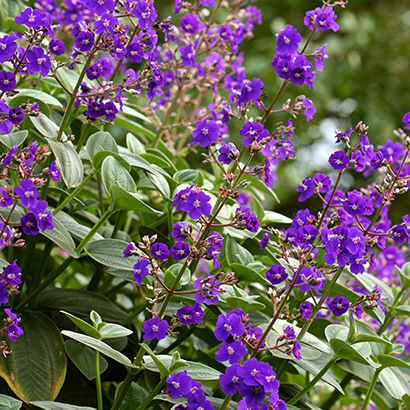 A relative of the more commonly grown “Princess Flower”, this darker and bluer Brazilian beauty blooms Summer to Fall and sports gorgeous, evergreen silvery-felted foliage on a fast-growing shrub/small tree to 10' tall and 5-8' wide. 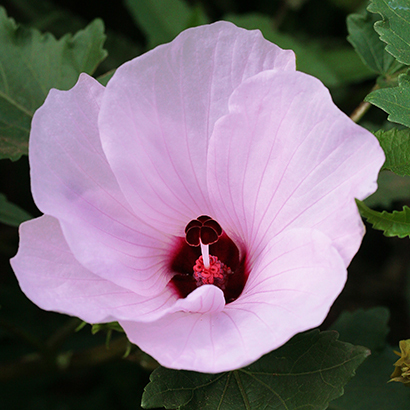 A gorgeous, long-blooming and easy shrub that can fill a large space quickly and beautifully, this evergreen and bloomiferous Hibiscus blooms JUNE - NOVEMBER here by the Bay with 4" cotton candy pink flowers with a cherry throat. Hummers! Rich soil with adequate moisture. Fabulous foliage! Reaching an astonishing 6' x 6', the huge "angel wing" leaves with a red reverse are green in shade and a sumptuous blue-black with more sun. Airy clusters of pink flowers on magenta stems bloom almost all year! Choice for frost free porches, patios and tropical settings. THE PERFECT prehistoric plant for that pesky dry shade spot! 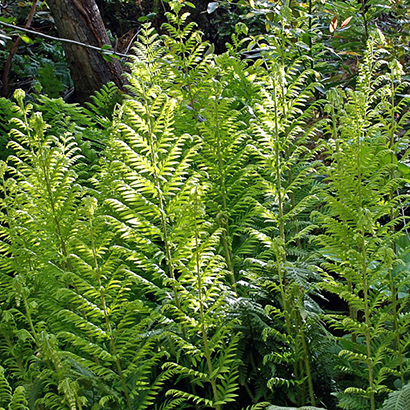 The largest fern endemic to North America, its evergreen fronds can reach 9’ tall, but will most likely grow 4-6’ tall and wide in the garden. With adequate Summer water it can deal with full sun, but prefers shadier spots. 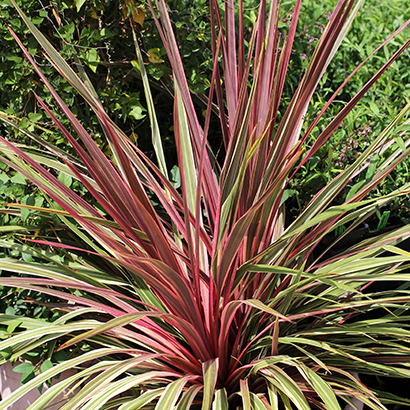 Perfect for containers on a patio or planted massed in beds, the weeping variegated foliage of this new clumping Cordyline bring color and bold interest to the garden with very little maintenance needed. 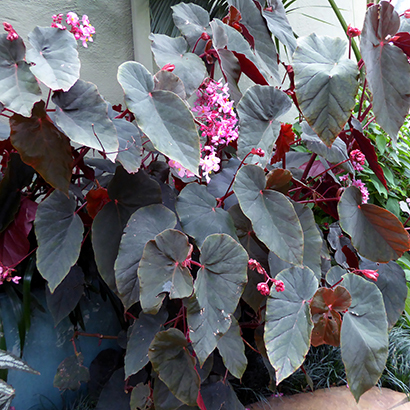 Leaves start out red and age to variegated green and cream with all colors on a plant at the same time. To 3' x 4' tall, hardy USDA zone 8. 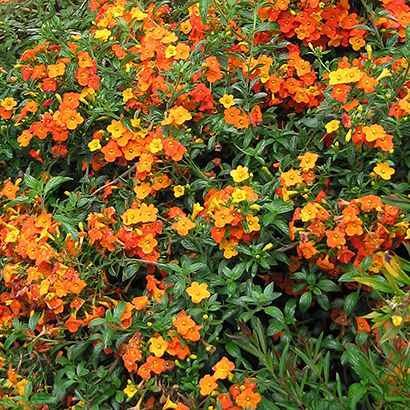 Blooming almost year-round here, this stunning tropical shrub boasts tri-colored orange, yellow and red blooms all at the same time. 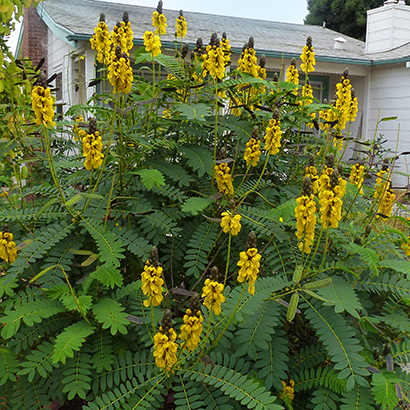 Multi-branching, fast and easy to 6' x 6', it's fantastic tumbling over a wall or weaving through neighbors. Hummingbird magnet!! 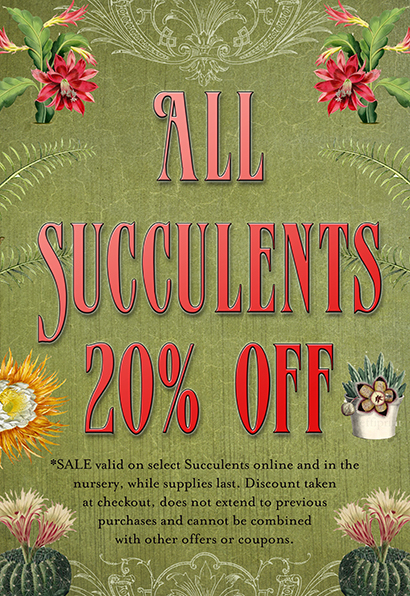 Beat the heat with choice succulents for the container or garden! You can even grow many of them as houseplants in a sunny window. Maximum happiness with minimum effort! Just be sure to provide adequate drainage and protect from scorching sun in Summer. Many varieties need protection from frost, but a surprising number are hardy to USDA zone 6 and below! Check 'em out!